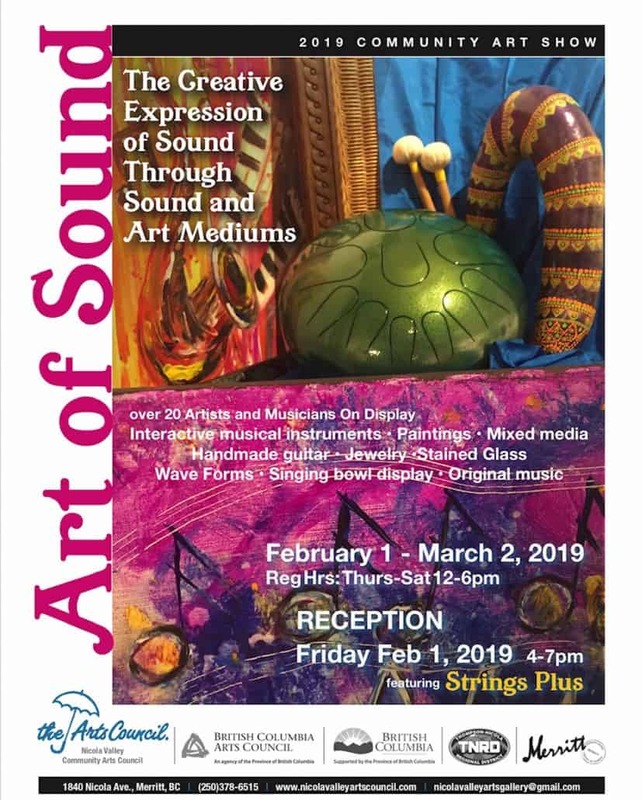 For the month of February 2019, the Courthouse Arts Gallery is ringing with the sounds of singing bowls, Djembe drums, vinyl records, wooden flutes, Leonard George rattles, handmade stringed instruments, and original songs. Even the art on the wall seems filled with sound and music! Artists and musicians get creative! We sent out the call to artists for the February Community Show, and received an interested and enthusiastic response! Evelyn Armstrong and Lin Butler Buchanan submitted black, white, and grey photos of nature – ice and stone, quiet and running water. Angelina Brooymans brought in photos of a grand piano and guitar playing. People are stopping at her photo of the piano at the Murray Church and reminiscing. 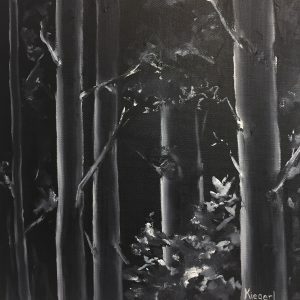 Jean Kiegerl’s black and white oil of quiet trees is a piece for reflection. Nancy Ellingsen brought in two reflective works, in dark tones – one an abstract and one I can’t stop looking at with its moody rainbow of colours. 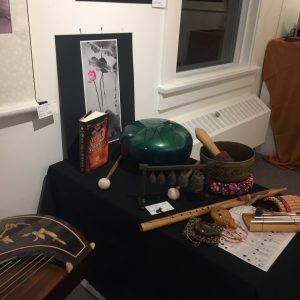 Shirley Lindgren’s guzheng instrument is on display, and she is allowing people to try it, play it. Shirley also has contributed several of her peaceful nature photographs. 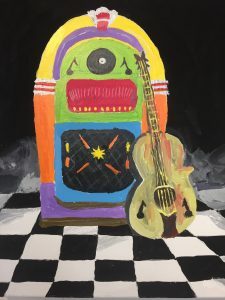 There are lots of submissions that suggest joyful and lively music, like the “Jazz in the Attic” collection, created in an afternoon of fun and creativity at the gallery months ago. And Shirley Reynold’s “Crescendo” sets a lively tone. These paintings are surrounded by instruments available for playing sounds and music: rattles, chimes, wind chimes, bells, and claves. Gale Simpson contributed her collection of brass singing bowls. Jane Bartle allowed us to display, and try, two of her flutes and a gorgeous crystal singing bowl. Robert’s Creek. This company makes the drums, with different scales, colours, and prices. Their motto is Creating Vitality Through Sound. Very interesting website showing the drums made to different scales. Creative BC! And the shiny green steel drum is a hit at our Art of Sound show. Besides the original music being played as instruments are tried out, we have two of our local Nicola Valley songs displayed on sheet music (Thanks, Jane!). Harley Carmen has set up an interactive display with his song and lyrics “Emmanuelle”. Kim Vizi-Carmen’s beautiful Maya Woman is displayed with Harley’s music. We have CD’s from Harley Carmen and Quade Lindgren. Quade also contributed a guitar, and stands for display and was a great help with the set up of the show. Artist Mordichai of Red Blue Dreams, created a model of instruments that can easily be made at home, accompanied by instructions to do so, and quotes about music and sound, a favourite display of the children coming to see the show. Local 1st Nations artist, Leonard George has created carved and painted wood rattles, all different, almost all available for sale. An eagle, a medicine wheel, a feather, a must-see! 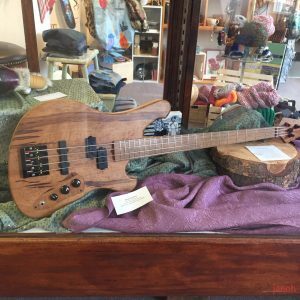 We are excited to have one of Ernie Pawliuk’s stunning guitars, displayed in our glass case. We have seen photos of Ernie’s guitar making in process so it is very interesting to see the work up close. Amrit Ahuja also brought in a guitar he made in grade 8! Amrit’s two guitars on display have been decorated with Sharpie art! Amrit Ahuja, also an audio engineer, printed and framed a variety of the sound waves created from different instruments. And a sound wave form made by the words, “I Love You”. A fusion of sound and art. 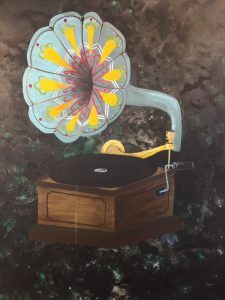 Michelle Lonsdale painted a gramophone called “Is This a Grandma Phone?”. It is displayed over another display: a record player with a box of vinyl records you can choose from to play – oldies and spoken word, like Janis Joplin and poet John Masefield. 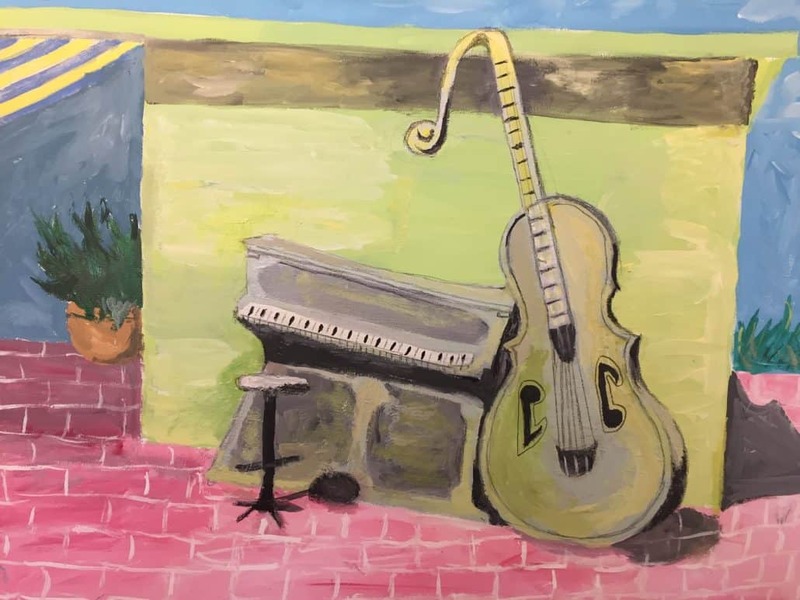 And Robert Moretti’s two paintings are a colourful addition- a jukebox on a checkered floor, and a painting of a piano and a guitar, Cuban public art. We are already getting ideas from the Cuban piece…perhaps a wood carving for our own musical town? Art exhibitions are a place of potential inspiration. And so are live music events. This show “Art of Sound” is both an inspiration for music making and art creation! It makes me want to hear more, see more, and learn more. Some of our contributors speak eloquently on the effects of sound on our well being-physical, emotional, mental, and spiritual. The vibrations of sound and their effects have been studied and used for centuries. Vicki Strom brought in a book to go with her display, “Yoga of Sound”. Some of the exhibition pieces are for sale! Check them out and add an original piece of local art to your walls! Reception done! Vanessa Trenholm catered a delicious table of food for our February 1st evening reception. Lots of people came and the rooms were filled with the sounds of…sound, music, chatting. Shirley Lindgren gave us demonstrations of her guzheng, a Chinese stringed instrument. And the group Strings Plus entertained our small crowd with their music, before gracing us with more at Open Mic later that evening. Feb 13, 6-7pm – Artist Talk with Artist/Sculptor Pius Chong. Come and Listen! 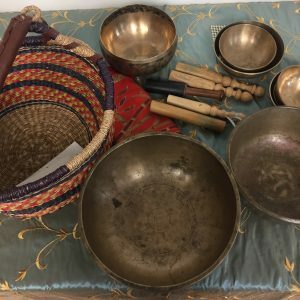 Feb 27, 7-9pm – Singing Bowls with Gale Simpson, and more sound exploration. And stay tuned for times for Raven Ritcey’s Djembe drumming in the Gallery. The Gallery is open Thursday to Saturday, 12-6pm. And join the Nicola Valley Community Arts Council, if you haven’t already! Experience Arts and Culture in the Nicola Valley!